Get over a dozen messy play for babies ideas that are easy to set up and safe for your baby or toddler. Plus learn some sanity saving tips to keep the messy play clean up simple. 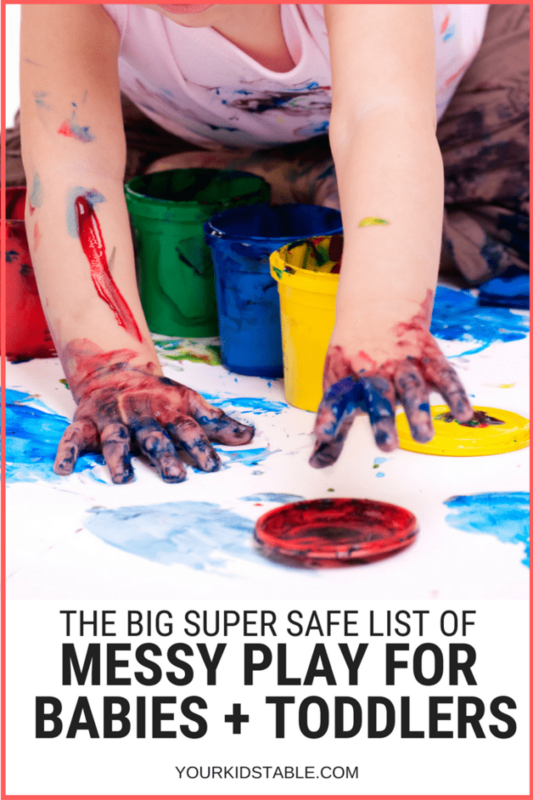 Have you heard that messy play for babies and toddlers is important? You’re here, so the answer is probably, yes! 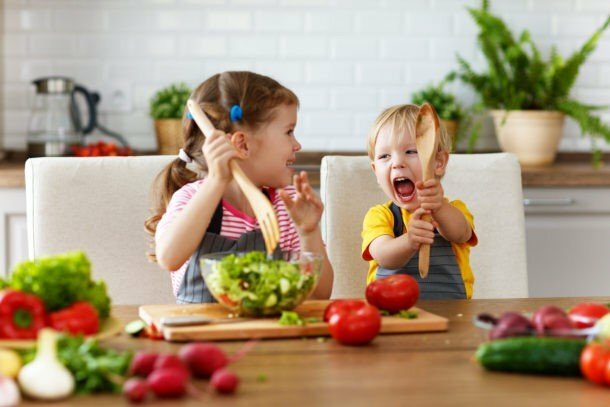 But, getting babies and young toddlers involved in messy play can be a little tricky because they put everything in their mouth. You have to worry every second if that colorful finger paint you grabbed at Target is going to end up in their mouth once you squirt it out for them to get messy with. There are some simple work arounds though that will give your baby or toddler as much messy play as you’d both like, while keeping them perfectly safe. I’ll share those with you here today, plus some other helpful tips to keep your sanity! 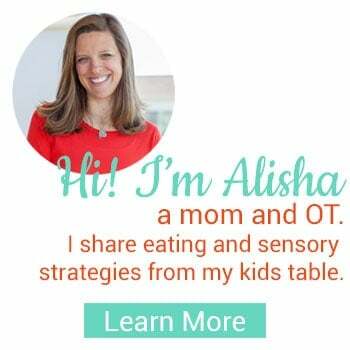 Before we get to that though, I couldn’t forgive my occupational therapy self if we didn’t talk for a minute about just how important messy play is for babies and toddlers. Keeping this at the front of your mind will help you, mentally, manage the mess better. Messy play is much more than just a fun activity for babies, it’s actually developing their brain further as so much input is given to their sensory system. But, messy play also can enhance their fine motor and cognitive skills as well. In short, it’s totally worth your time! 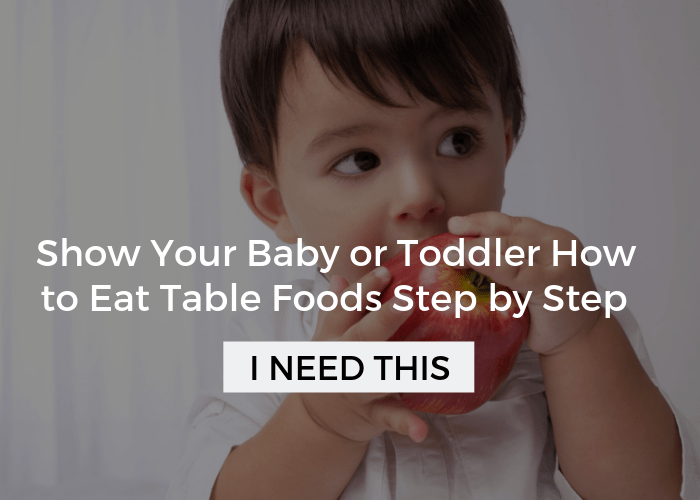 First, try to pick a time a day when you and your baby aren’t exhausted or hungry. Since babies are often eating or sleeping, you’ll want to find that magic window when you have 20 minutes to allow them to explore with your close supervision. Before this time arrives, try to have all your materials ready to go so you don’t have a lot of set-up. Many of the messy play ideas for babies and toddlers would work best in a water table (this is one we use) or large plastic container. However, sometimes a cookie sheet with edges on it can get the job done. In any case, you may want to lay out a vinyl table cloth first for easy clean up. To hold babies interest with messy play even longer, consider adding toys, shovels, and paint brushes half way through the activity. If messy play is really hard for you (I get it), set it up outside or even with your baby stripped down and inside of an empty bath tub. Then repeat the mantra “It can be cleaned up and this is good for my baby.” Lastly, dump, spread, and squeeze those textures too, your baby will love your involvement and you might forget about the mess, for a moment anyways! You don’t have to do messy play everyday, although it can have great benefits, especially if your baby isn’t too keen on touching different textures. Shoot for 1-2 times a week to keep it manageable. If your baby is freaking out at touching different textures, it may be because they’re tactile sensitive. That’s okay! But instead of ditching messy play all together, think about taking small baby steps that will help them get used to textures over time. Breaking down the sensitivity is worth every minute of your time. Focus on dry textures like corn meal first and work your way up to wet messier textures. 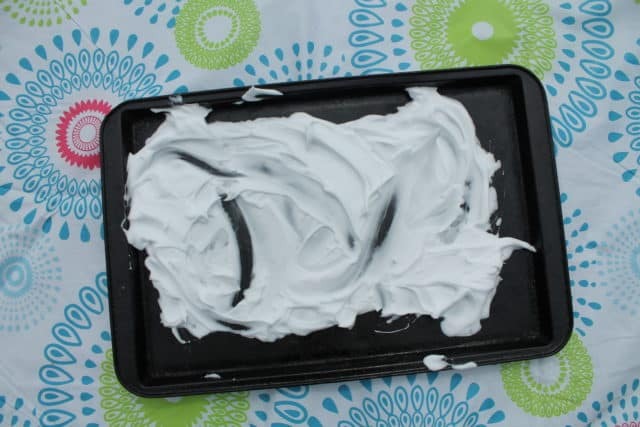 Shaving cream is one of my favorite textures to use for messy play with kids, but that isn’t going to fly with babies. Whipped cream either from a can, tub, or homemade is a totally safe solution that give lots of the same type of sensations. In the pic above I’m using a vinyl table cloth with the whipped cream spread out on a cookie sheet. Again either homemade or store bought, pudding can be a fantastic texture for babies to get messy in! Only recommended for hot days, but taking crushed ice or ice cubes and putting them into some water can also be messy play. It’s great to expose babies to gritty textures in messy play too. Corn meal gets the job done and is totally safe. Squeezing flour gives babies a totally different sensation and allows them to make clumps that stick together for a few seconds. It’s a great cause and effect realization for them as they play. Check out this easy recipe and even store inside of recycled baby food jars for multi-use. Think leftovers! Or, dye your noodles if you’d like to take your sensory experience up a notch. Aim for plain whole fat yogurt because it’s thicker and doesn’t have the added sugars making it more sticky! Make one big blob, mold into different shapes, or present it diced up. Each will give it’s own unique sensory experience! Simply mix some flour and oil together to get a unique and fun texture that’s actually not quite as messy. Cloud dough will hold it’s shape, to some extent. Pull out the plastic cookie cutter and sandcastle toys so your baby can crash and smash towers or buildings. Now we’re getting messy! Oobleck is one of the oddest and most interesting textures and it’s totally baby proof since it’s simply a mix of cornstarch and water. 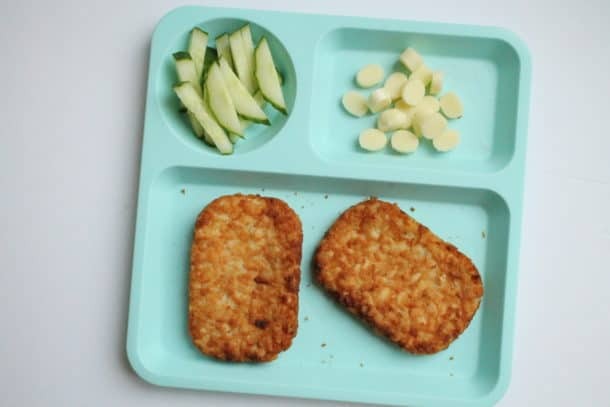 It’s a thin liquid texture which means you may want to keep it confined in some sort of container. Good ol’ fashioned bubbles can cause babies and toddlers to squeal in delight. Think about using non-toxic soaps to fill a tub or container with bubbles and a little water. Any cereal will do, but I like using small cereal like Rice Krispies or Kashi Go Lean. If you have a box that’s expired in the pantry, use it! Marshmallows provide a different and interesting texture. 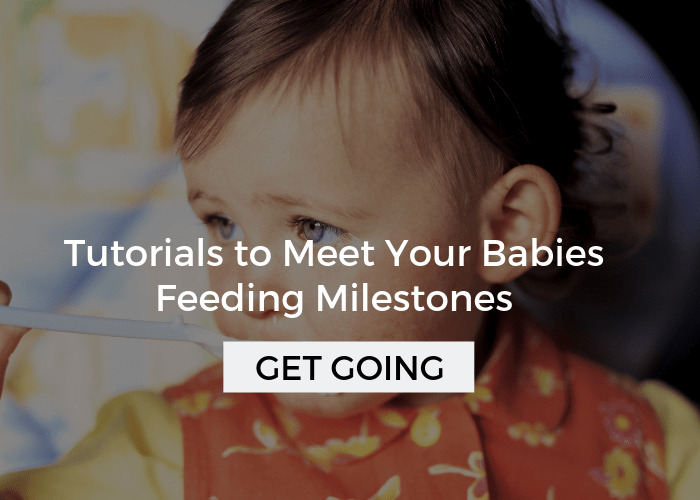 Encourage your baby to squeeze and tear them up. Avoid mini marshmallows as they can be a choking hazard. Another gritty texture that is perfect to create a sandbox like experience. Any combination of these can give babies lots of different feels, and it’s super easy to clean up! Babies may bring these to their mouth, but they likely when keep trying once they feel the odd texture on their tongue. It is perfect for their little hands though! This can be a more intense texture! Focus on small amounts, maybe from last night’s dinner. Spoons and cups will be perfect. Sensory bags – Take a Ziplock back and fill it with hair gel. Smooth it out and possibly add some glitter and other tiny objects. Allow your baby or toddler to squeeze and look at the bag. 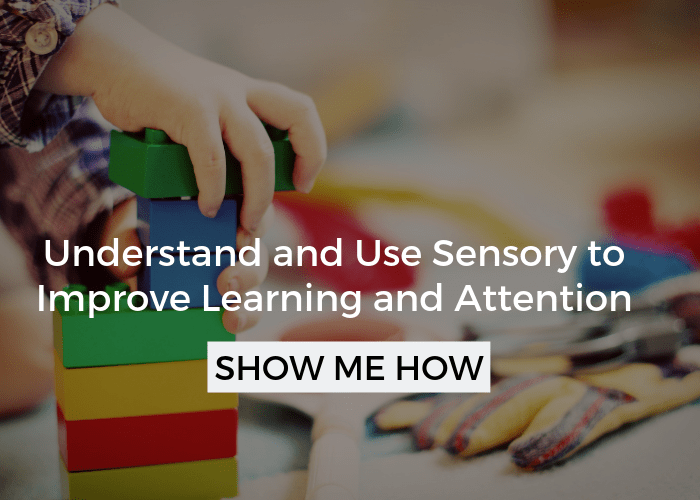 Sensory bottles – Use a recycled and sturdy water bottle to fill with oil, water, food coloring, and tiny toys to create an interesting visual display for babies to watch when the bottle is shook up. Colored scarves – One of my favorite toys for babies are sheer multi colored scarves. Not only are they giving babies a different texture as they grab them, it’s also wonderful visual stimulation as the scarves cover their faces and float through the air. You can also add these scarves to a used tissue box and encourage your baby to pull them out! Ribbon box – Tie 10 to 15 ribbons from the edge of a table or box and let the ribbons dangle. Babies and young toddlers will love tugging at and running their hands through the ribbons. 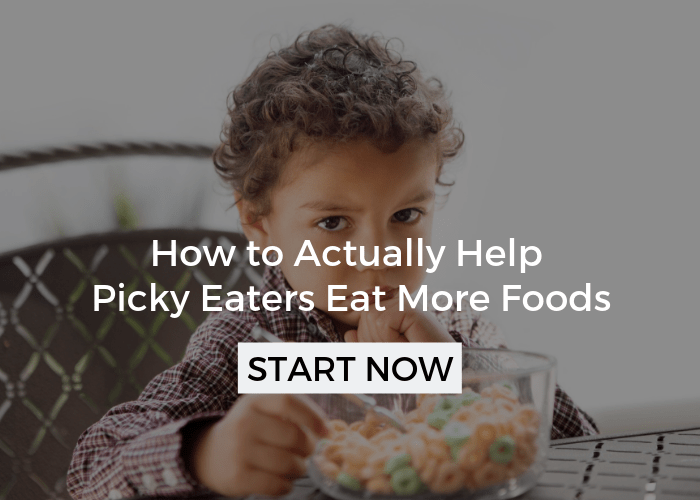 If you’d like to keep the tips for babies and toddlers coming, join our weekly newsletter and I’ll send you our mega list of toddler food ideas. It’s one of our most downloaded free printables. I think you’ll love it. Get it here! 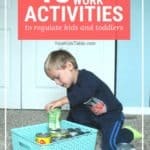 Want to check out this list again, pin it to your baby or toddler board! Hi.i am iranians teacter of children and i am excited about the new plays and topics for chidren. Can you pleas teach me them? 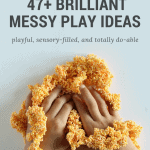 Hi Mohsen, The post has all the info you need for messy play ideas. You can also use the search bar at the top of the page to search for any other topics you need help with.